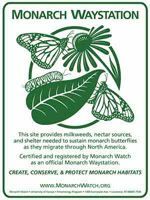 We've long passed the peak migration period for the Monarch butterflies in our area (mid-September), even though we saw one in the garden earlier this week. The straggler had better get on his way before daytime temperatures become too cold. 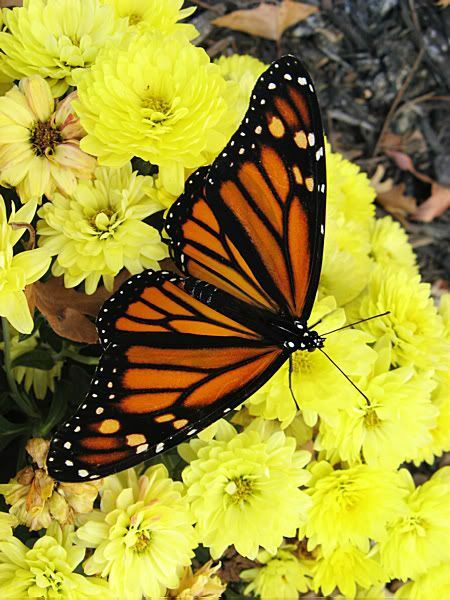 Monarchs can't fly in temperatures below 50° F, which is why they flock in trees overnight until it's warm enough to continue on their long journey to Mexico. Just about now, the first Monarchs are arriving at their winter roosts in central Mexico, completing one of the most amazing migration trips in the insect world. 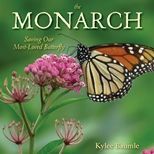 In case you've never heard the story of the Monarch's life cycle and how they deal with northern winters, Nova has done a wonderful piece for PBS called The Incredible Journey of the Butterflies. It's shown periodically, but you can watch the 50-minute program online at your own convenience. We live in the land of Johnny Appleseed. To our east, not far from here, is Defiance, where he established one of his nurseries on the north bank of the Maumee River. Most of the early apple orchards in our county (Paulding) were started with seedlings from that nursery. Just a short distance west of us, in Fort Wayne, Indiana, lie his remains. I've always thought that it was cool to think about, that this American icon once walked where I walk today, spreading seeds as he went. And it is an interesting thought, but I learned something last night, while watching The Botany of Desire on PBS. The trees he planted by seed were largely inedible as a snack. Good for cider, though. When we moved to our house here at Our Little Acre in 1977, my parents bought two apple trees for us to plant. 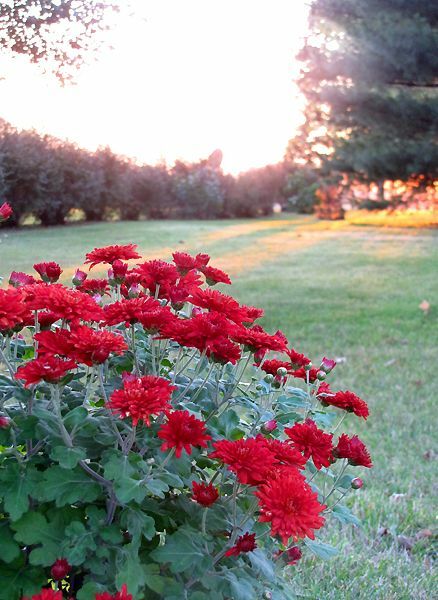 They were both 'Red Delicious,' which I recently learned is probably the best kind to plant here, as they are most resistant to cedar-apple rust. Those two trees have given us many apples over the last 32 years. One of the trees has always been smaller than the other and has produced less fruit. In recent years, it's declined in health and we've gotten very few apples from it. About two years ago, the tree began to lean considerably and we had to prop it to keep it from falling over altogether. Finally, we decided the time had come to cut it down and plant a new one. 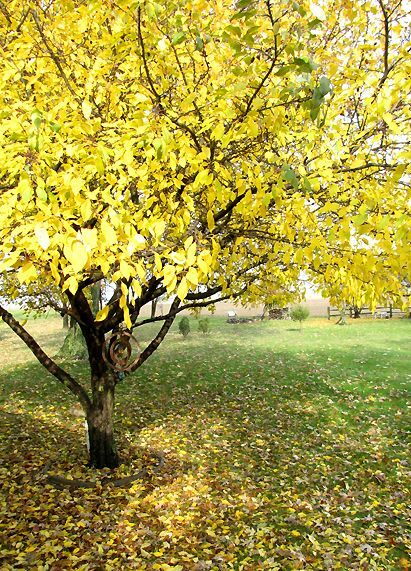 Yesterday was a beautiful fall day and I suggested to Romie that we take care of the ailing apple tree. No chain saw or axe was necessary. Because we'd had plenty of rain recently, the ground was pretty soft. 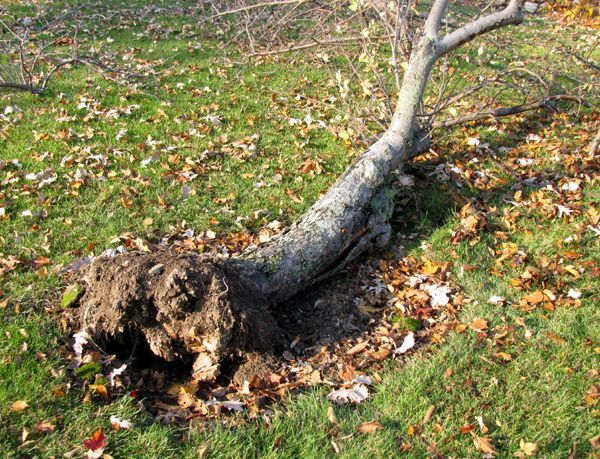 All it took was a good hard shove and the tree fell over as the roots gave no resistance. Those roots held the key as to why the tree was both not producing much fruit and could not stand up straight. They were shallow and rotting. 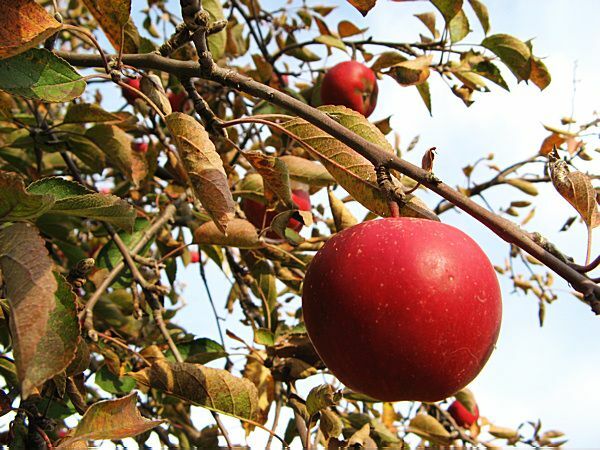 We want to plant another apple tree and would like to have 'Golden Delicious.' 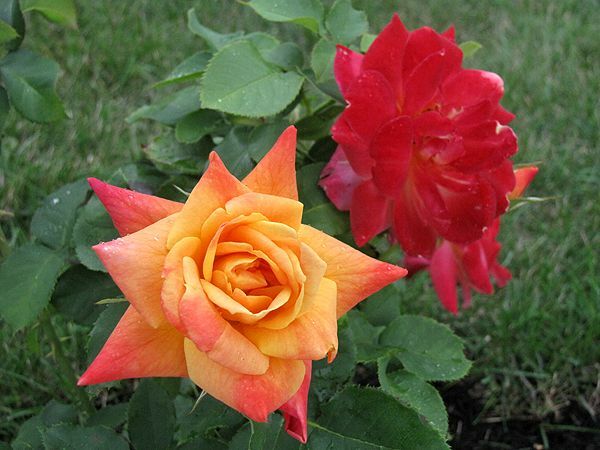 However, it is one of the varieties that is highly susceptible to cedar-apple rust, which is common around here. The search is on for a suitable replacement. 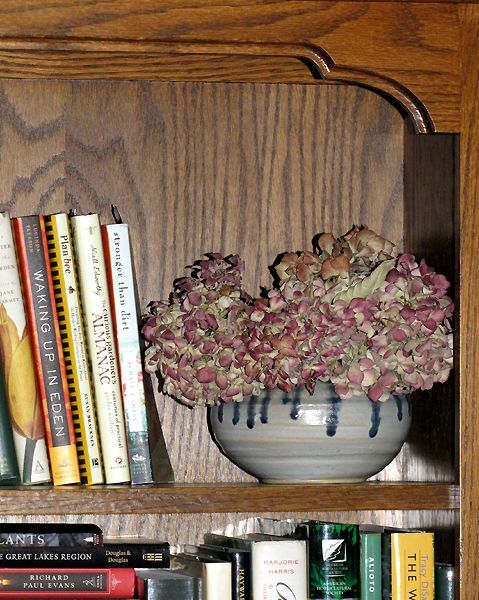 Who thinks orchids are scary plants, hard to grow, and expensive? *raises hand* Judy White is here to tell you it's not true! 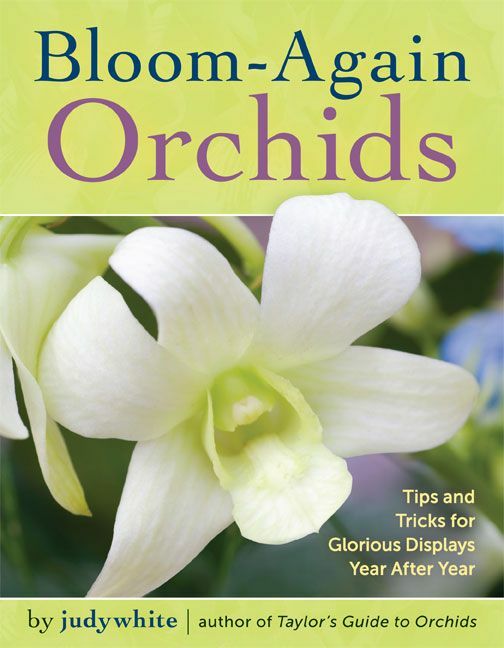 In her new book, Bloom-Again Orchids: 50 Easy-Care Orchids that Flower Again and Again and Again, she attempts to debunk the common myths about growing orchids. 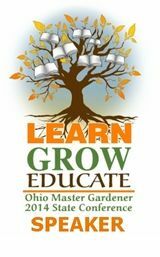 As one who has grown orchids for about three years now and has encountered some of the difficulties commonly associated with them, I was really interested in what Ms. White had to say. Her book is easy to understand, with the guidelines for growing orchids laid out in a concise, simple manner. 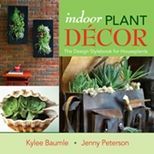 She lists 50 orchids for growing that are easy to find, easier to grow, and relatively inexpensive, with information specific for each one. When one is an expert in their field, with years of experience behind them, it's easy to say that something is...well...easy. Much of what is learned becomes instinct. After awhile, you just know. And while I'll agree that her tips for orchids aren't difficult, following them does require a bit of vigilance and effort above and beyond that of the ordinary, everyday keeper of houseplants. 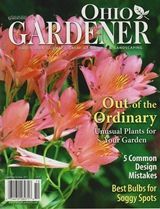 Most gardeners know that orchids aren't the kind of plants that you simply water once a week and expect to produce those exotic, luscious blooms. 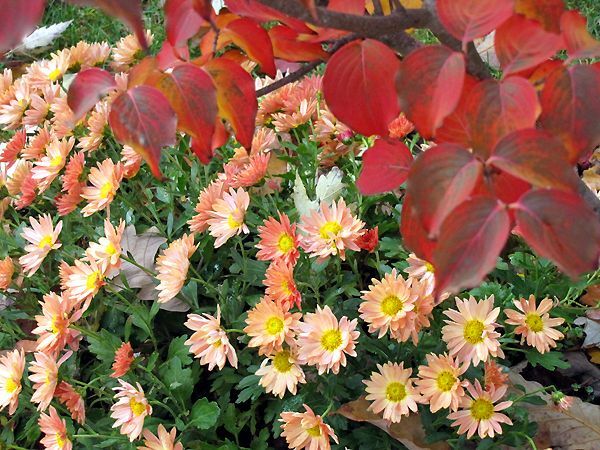 There are many things to consider, such as soil type, amount of light, amount of water, how to water, fertilizing, etc. Different types of orchids have different requirements. But with this book at your side and a little effort, you too can grow orchids that will be the envy of the neighborhood. judywhite is author and photographer of the award-winning Taylor's Guide to Orchids (Houghton Mifflin 1996). Her photography has graced many books and publications, and has been exhibited at the Smithsonian Institution. A former research biologist and past editor-in-chief of one of the world's first mega-gardening Web sites, Time-Life's Virtual Garden, judywhite is married to British garden writer Graham Rice. She is proud to say she has killed orchids on both sides of the Atlantic. You may have noticed that I added what's called a "Facebook Fan Box" in the column on the right. It's likely that you've heard of Facebook before, and perhaps you're a registered user. Good for you! I'm a huge fan of the site, though I wasn't always. When I first signed up, I wasn't sure it was something I would even use very much. Facebook has put me in touch with former high school and college classmates, friends I'd lost contact with, and people with whom I have a common interest. It's just one of many social networking sites available to internet users. I use several social networking sites and each has their own unique way of providing me with the tools to connect with those who share a particular interest. Like gardening! Blotanical has put me in touch with so many wonderful gardeners around the planet, I can't begin to even list the people I've met there. 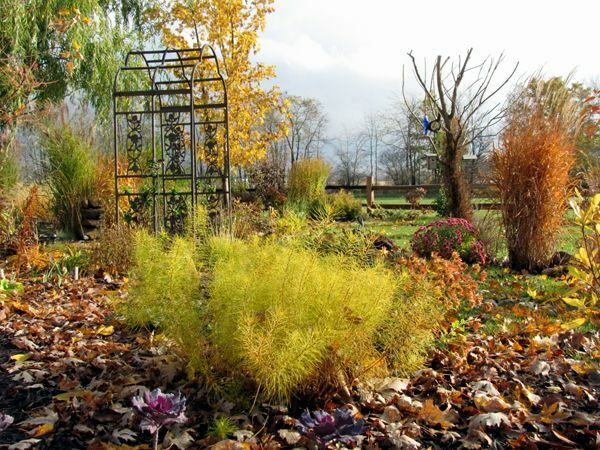 Twitter is another social networking site that I didn't think I'd use much, and although I don't frequent it as much now as I did at first, it too put me in touch with a number of wonderful gardeners. I met Shawna Coronado (The Casual Gardener) on Twitter. Then along came Facebook. I used it for staying in touch with people that I've known for many years - people that I've met and are relatives or friends in my personal life. Then I found some of my online garden blogger friends were there and some of them found me. My friend list grew. 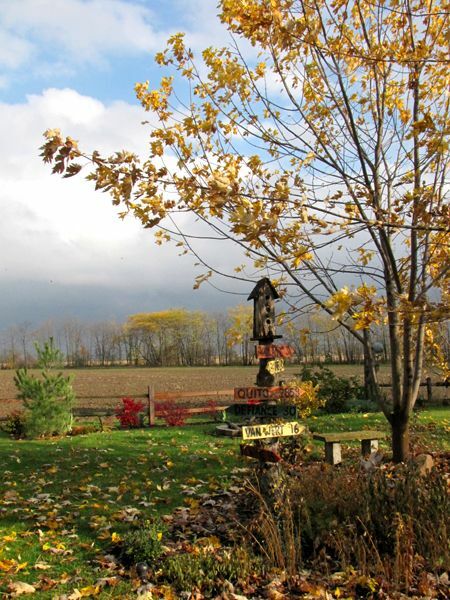 I started posting updates to my blog on my personal Facebook page, then as more and more businesses and organizations began to have Fan Pages, I thought it would be nice if Our Little Acre had a Facebook page of its own. There I could post updates from my blog as well as photos from the garden and random happenings related to gardening without cluttering up my non-gardening friends' updates. So the Our Little Acre fan page was born. As of right now, the page has 100 fans and I'd be happy if that number continued to grow. 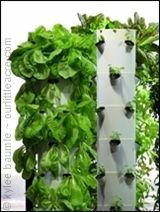 If you become a fan, any updates to the blog or random comments and photos concerning the garden will show up on your Home page right along with your friends' updates. Won't you join me on Facebook by becoming a fan of Our Little Acre? As I mentioned in a previous post, Lola has a new home. She spent her last full day here at Our Little Acre on Friday and her new owners came to fetch her on Saturday. They were excited to meet her and take her home to be part of their family and we were happy that she was finally going to live the life she deserved. She is now a Hoosier kitty, living in Indiana, as is Cocoa, the kitten we adopted out a few weeks ago. I guess we can't be too picky about the homes they go to. (Just kidding!) 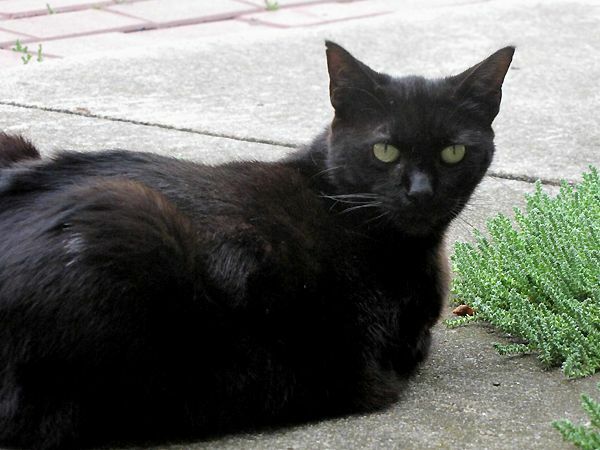 Actually, when asked whether it made us sad to see Lola go, we could truthfully answer no, because we knew she would be pampered and treasured as an "only" kitty, inside. "Lola's doing great. Took a couple of hours for her to figure out there was no other cat. She's figured out how to get in from the back porch, kittie door, but is still working on going back out. She enjoys being where the action is and she is lovable. If one of us moves, she's right there. Absolutely loves being brushed! Favorite place to sleep at the moment is my closet. Has no interest in going outside which is good because we live in town. I think she knows she's home. Thanks for Lola!!" Now, hearing that makes my eyes misty from joy over another successful adoption! The morning greeted me with downpours of rain and continued until mid-afternoon. 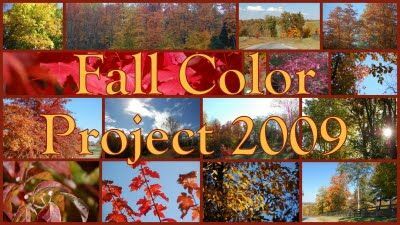 This put an end to the nicer days of our Indian Summer, but for several brief shining moments, the sun returned long enough for me to capture some colorful fall images here in Zone 5b. 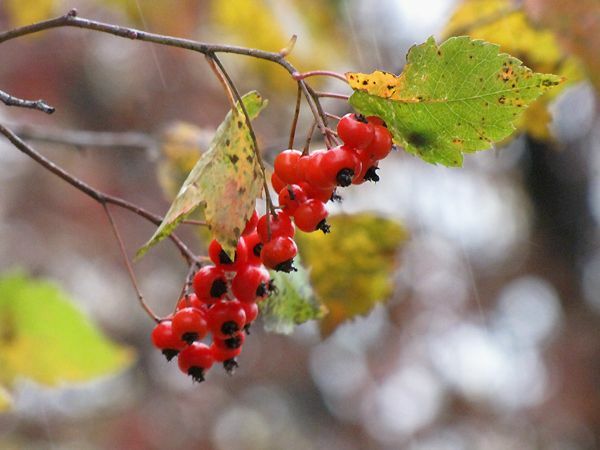 The birds love the little red berries! 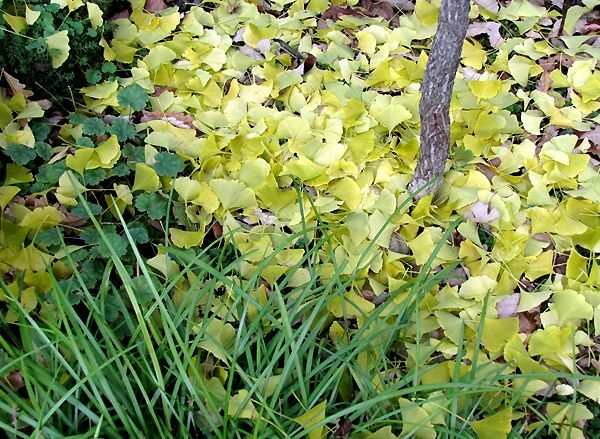 A hard rain with no wind causes leaves to simply drop at this Ginkgo's feet, among the hardy Geranium 'Firefly' and Lily Turf (Liriope muscari). Someone needs to do some raking! 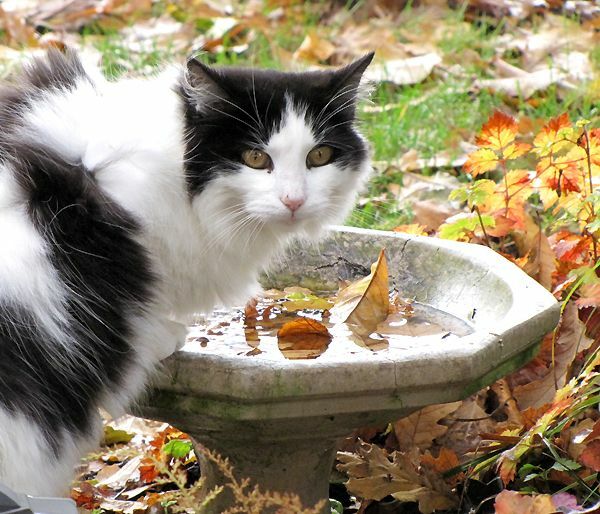 Luna (and the other cats) thinks this bird bath is a fancy drinking dish just for them. 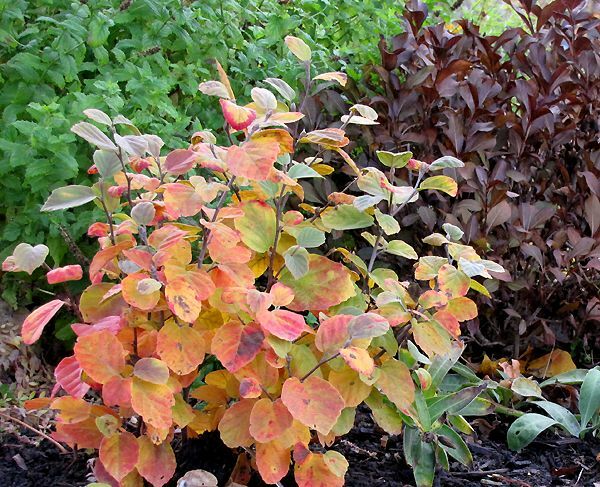 Astilbe 'Color Flash' is living up to its name, in the background. 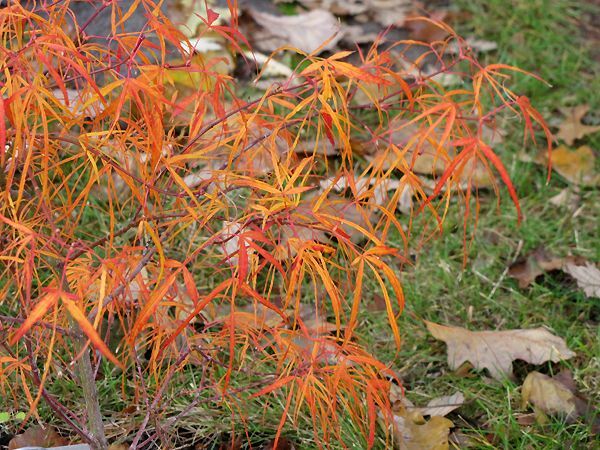 Japanese Maple 'Harp Strings' (Acer palmatum 'Koto no ito'), purchased at this year's Cincinnati Flower Show, is small and will eventually reach 6-8 feet. Boo pauses between sips of water from a terra cotta saucer. 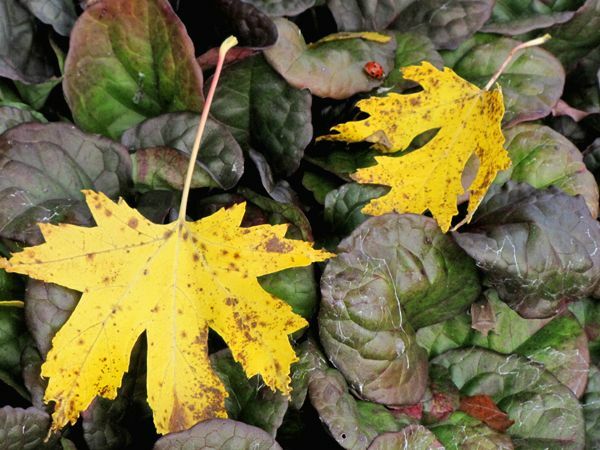 The maple tree's falling leaves are caught by the ground cover below it, Ajuga reptans or Bugleweed. 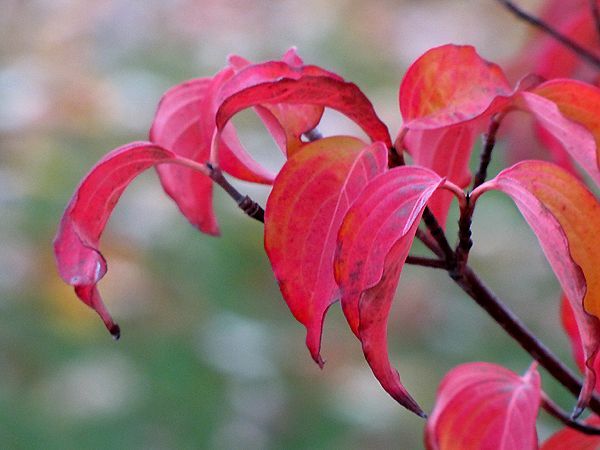 Join Dave at The Home Garden for more fall color around the world. It's a fairly well-known fact that we are kitty magnets. We don't seek them out, but somehow a considerable number of cats have found their way to our place. At present, our feline population is officially ten. Our neighbors have this unique trait as well, perhaps even more so than we do, because their total at the moment is fifteen. On Saturday, we'll drop by one when Lola will be adopted out. We're so happy for her, because after living in a cupboard for months, she'll be an "only" cat, inside! Here, she rarely ventures outside and has lived the entire summer inside a cupboard in the pool house. 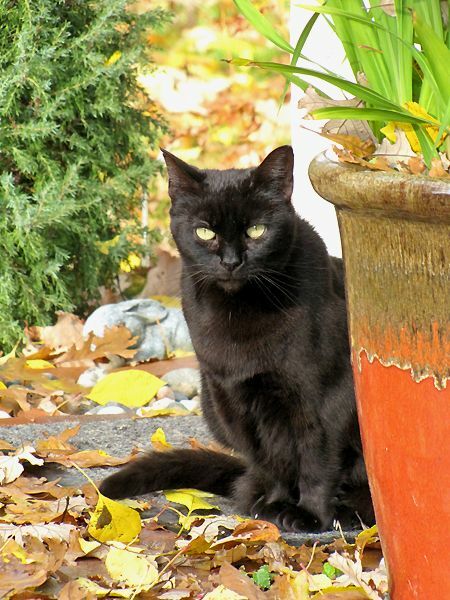 She has never liked being outside, which leads us to believe she was a house cat before she showed up here last fall. She started out living in the garage all winter, then moved to the pool house for the summer. Whenever one of the other cats shows up in her range of vision (quite often), she opens a cupboard door and stays inside the cupboard for hours until she decides it's safe to come out. Poor thing. The other cats never bother her, but she just isn't taking any chances. Now she'll be able to live the good life. Last night, we had a "kitty" of a different kind in the pool house. Romie had gone out to put the cats in for the night and immediately came running back to the house and told me to come quickly and bring my camera. There was a skunk in the pool house. Okay, not really a huge deal, except that four of the cats were also in there. OH NOOOO!! I was freaking out about the other cats, thinking they were going to get it since every single one of them was within spraying distance, but the skunk totally ignored them. The cats must have known to leave him alone, because they watched him warily and kept very quiet. All except Lola. 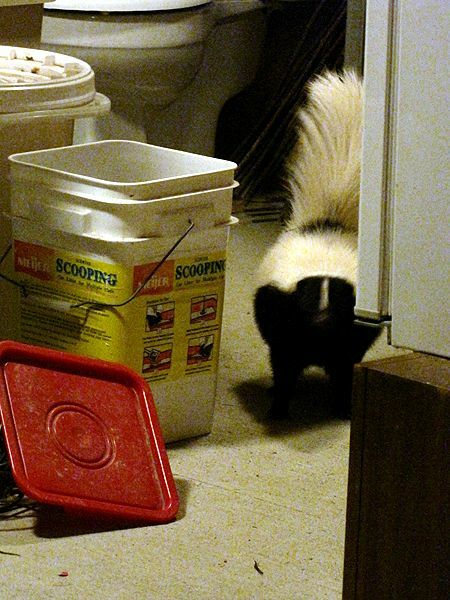 Of all the times for Lola to come out of the cupboard, it had to be when a skunk was in there. 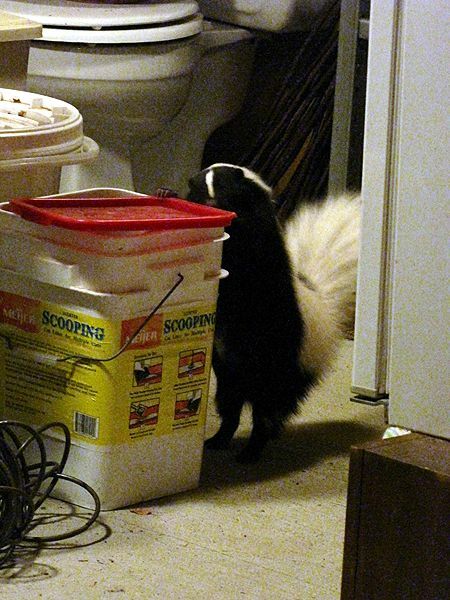 I could hear her growling and when she jumped up on the bucket and perched herself just above the skunk, I cringed. If that wasn't bad enough, she swatted at his tail and I thought it was going to be all over but the crying (by me). Mr. Skunk was unconcerned. He was on a mission. After eating all the cat food in the dish, he located the large bucket where we keep it and set to work at getting the lid off. Romie and I were watching outside the pool house while all this was going on. Romie was tall enough to peek in the window and see beyond Sunny and Boo who were sitting up on the window shelf. I kept a safe distance of about fifteen feet from the door and had my "fight or flight" mode engaged. I can tell you it was going to be "flight" if it came to that. It was actually kind of fun watching the skunk trying to get that lid off. He used his tiny paws and his snooty nose and eventually popped it off. He ate some of the food while the cats continued to watch. At some point, both Jack and Lola walked out of the pool house, so I took them and put them into the garage. 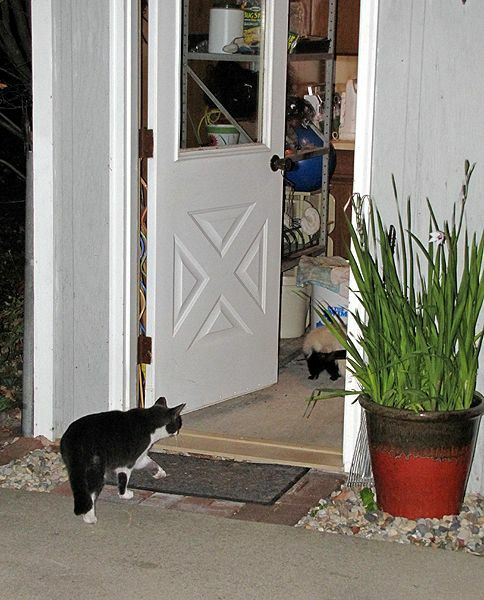 We worked at getting all the other cats put into the garage as well, so that they wouldn't let their curiosity get the better of them and wander into the pool house to see what was going on. What happened next surprised us both. 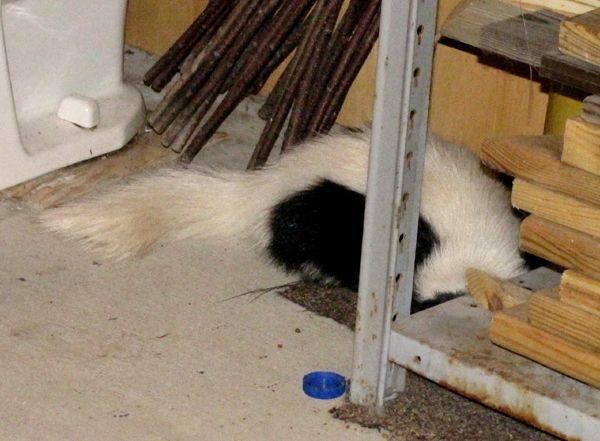 The skunk, having had his fill of food, waddled over to a corner and curled up on the floor and WENT TO SLEEP! Sunny and Boo were still in the pool house, up on the shelf, so we (carefully and quietly) took that opportunity to walk in and grab them so we could put them in the garage, too. Mr. Skunk slept on. Eventually, he woke up and walked out of the pool house, over to the neighbor's. Romie saw him and once he was gone, closed the pool house door. Whew! Disaster averted. But a short time later, when we turned the outside light on, just to check if he'd come back, what do you think we saw? A different skunk, sniffing around. This one had a black tail. We're just going to have to make sure we get that door shut before dark. We were lucky this time, but we might not be so fortunate again! 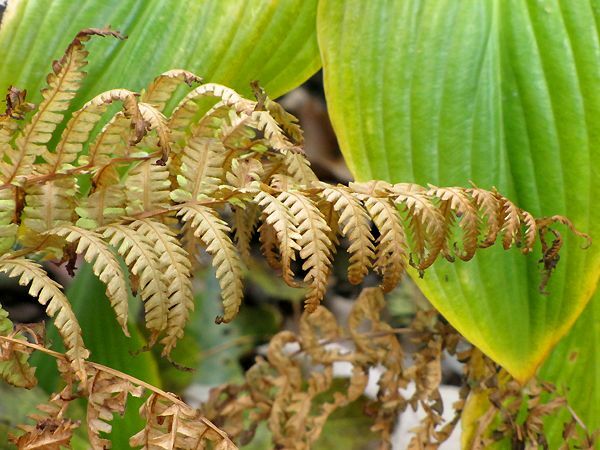 Debra Lee Baldwin, book author and contributing writer at Gardening Gone Wild, introduced me to the concept in her recent post, Wabi-sabi in the garden. If you break the word down into its literal translation, it is something like this: Wabi is something that evokes a feeling of rustic simplicity and understated elegance. Sabi is that which can be seen as beautiful and serene by virtue of its visible imperfections due to natural aging or necessary repair. While I can think of many things this can be applied to, I'll be honest in saying the first thing that comes to mind to me personally are those crow's feet that decorate my eyes. The youthful look to my skin didn't last, my skin is not done wrinkling, and my skin sure isn't perfect. But I like this idea of using the term wabi-sabi to describe it. Makes it sound it's a desirable characteristic that I've now achieved. Yay me! 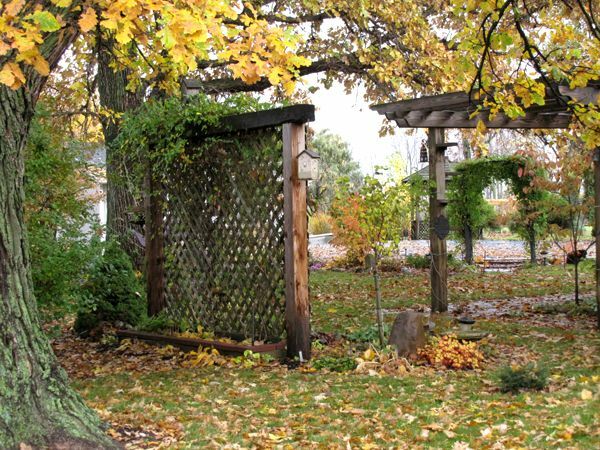 Debra shows what wabi-sabi means to her in the provocative photos she posted and she challenged her readers to slow down and see the imperfect, yet beautiful, in our fading gardens. 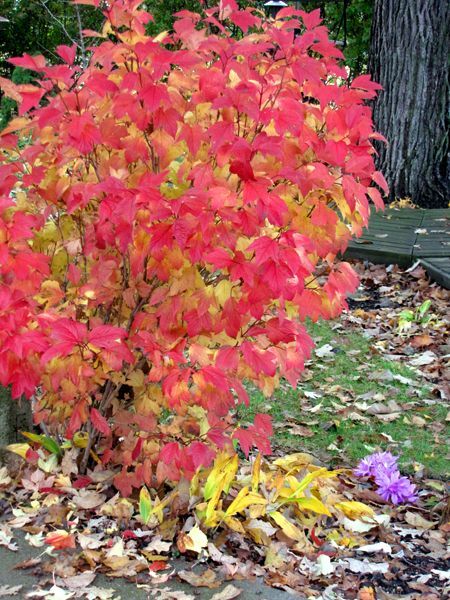 On this lovely, sunny fall day, I welcomed the opportunity to look beyond the brown leaves and bare spots. The first killing frost of the season came early this morning. Two light frosts earlier didn't faze anything in the gardens except for newly emerging Elephant Ear leaves, but this one was more than the remaining annuals could take. 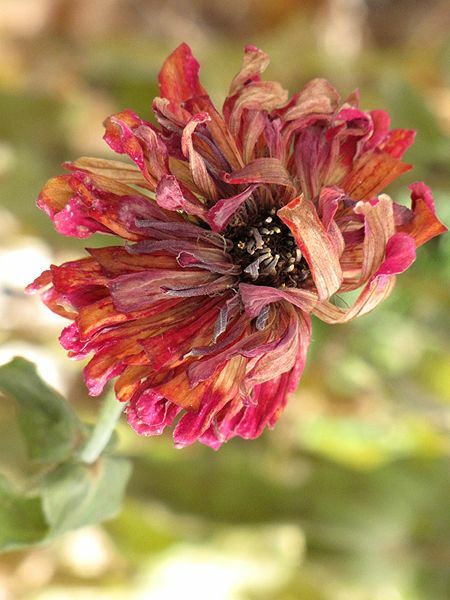 Yet the shades of pink and orange remaining in this 'California Giants' Zinnia are nearly as stunning as they were in their prime. 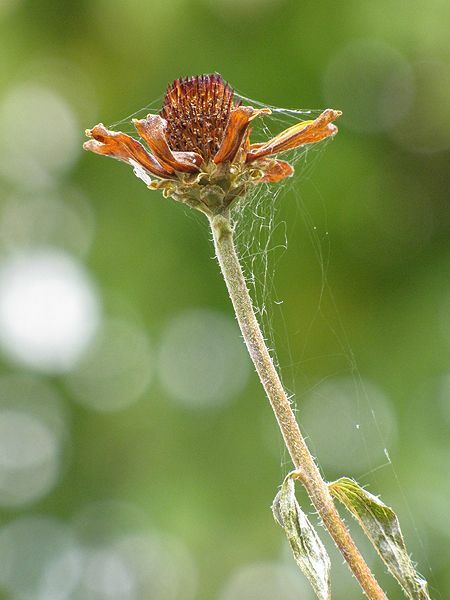 Another Zinnia, 'Chippendale,' has long been dried on the stem, but it still serves a useful purpose to our spidery friends and the seeds contained in the head will be food for birds. If I collect the seeds, it means these Zinnias will live on next year, when I plant them again. It's the circle of life portrayed in many ways. You thought it was a dead flower. 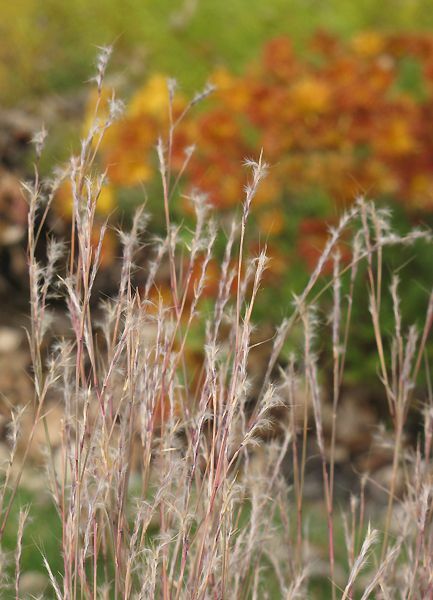 Little Bluestem Grass (Schyzachirium scoparium) was planted last fall and has really done well this year. 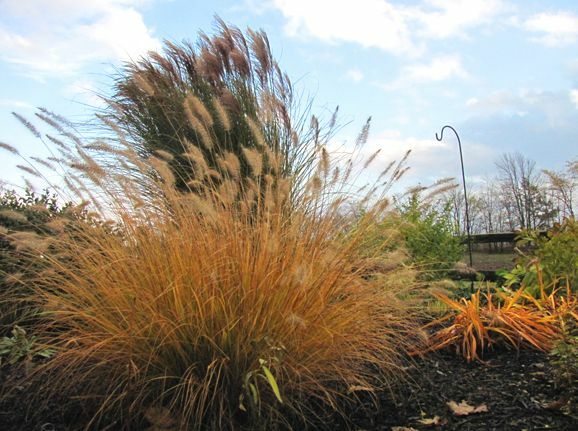 There is such grace and beauty in its flaxen feathers, wafting to and fro in the breezes of autumn. 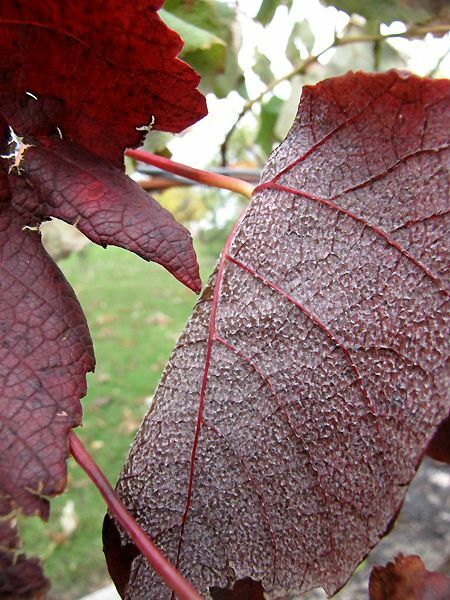 Amazingly, the 'Mars' grape (Vitis vinifera) vines turn a deep wine shade in the fall, echoing the color of the grapes it bore earlier in the season. Hmmm...do leaves have crow's feet, too? 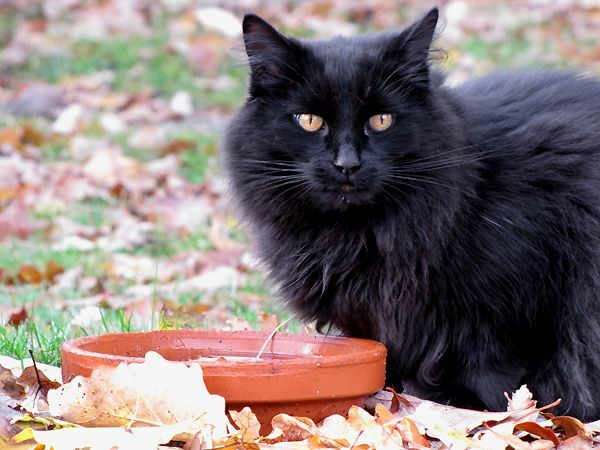 The blue bird bath is used more by the cats for a drink than for bathing birds. 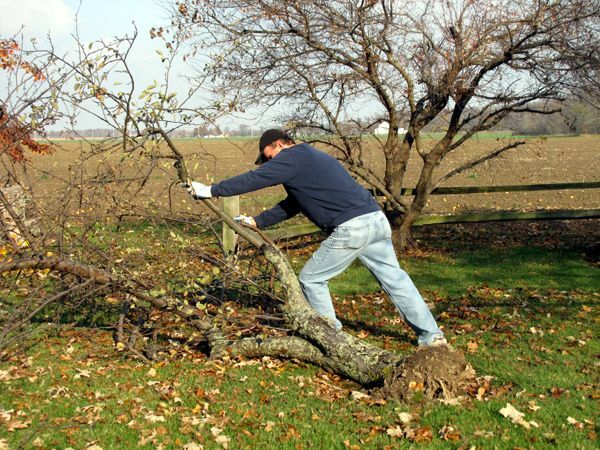 In the fall, the leaves from the oak and maple trees find their way into it, making cleaning a regular task. 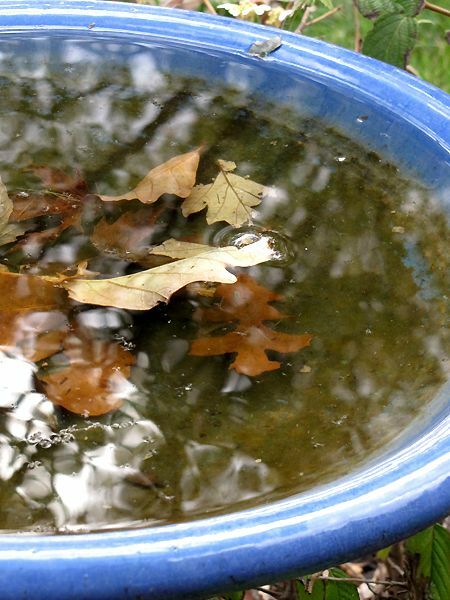 The contrast of the cobalt with the browns of oak catch my eye, but my thoughts also turn to the rich organic nutrients in the water, which I'll pour on the plants below when I clean it once again. 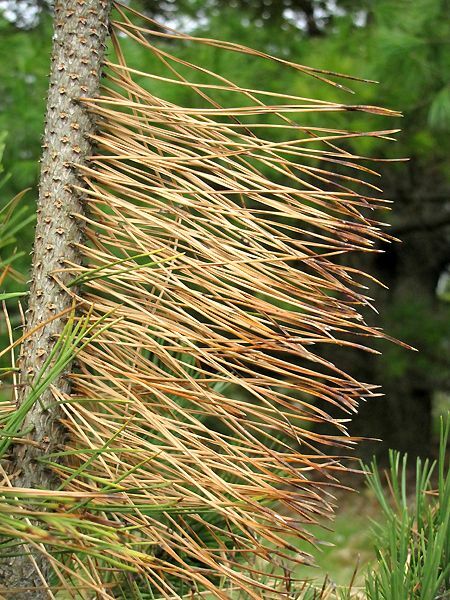 Though the Austrian Pine (Pinus nigra) tree remains evergreen through the winter, it always loses some needles along the main trunk when autumn comes. In just days, these will fall, providing a soft bed of mulch at its feet. In the dry summers, I struggle to keep the Ostrich Ferns (Matteuccia struthiopteris) moist enough to sustain their large fronds. 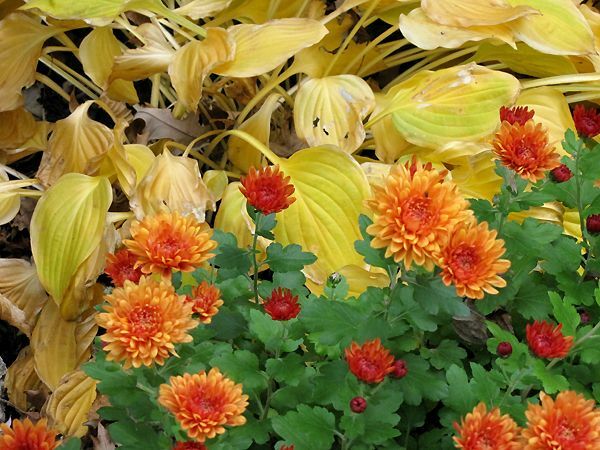 By fall, no amount of water will keep them from turning brown and going to sleep for the winter. Still, they're graceful and elegant with their zig-zaggy form. 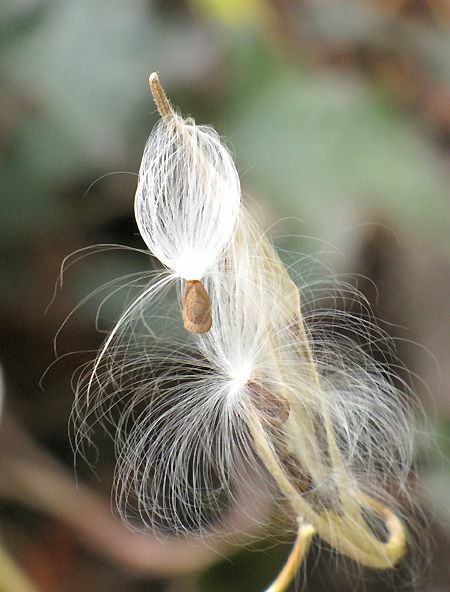 The Milkweed (Ascepias tuberosa 'Hello Yellow') erupts into glorious silken seeds that become airborne when the dried pods burst open. 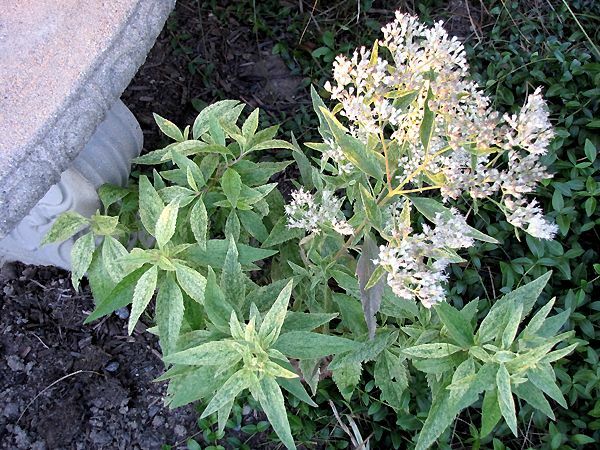 The Monarch butterflies will be happy to see the new plants that will result next summer and be home to their offspring. Thank you, Debra, for introducing me to wabi-sabi and compelling me to search out and find it in my own garden. It was a good day. 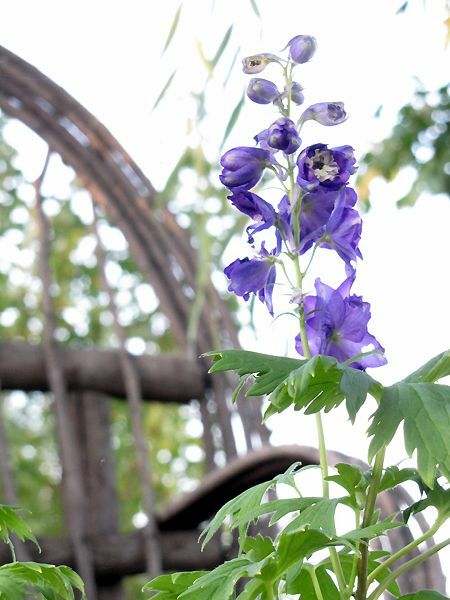 The Delphiniums are reblooming, and have been for the last couple of weeks. Over a month ago, I cut the spent flower stalks down to the ground while noticing new growth at the base of the plants. 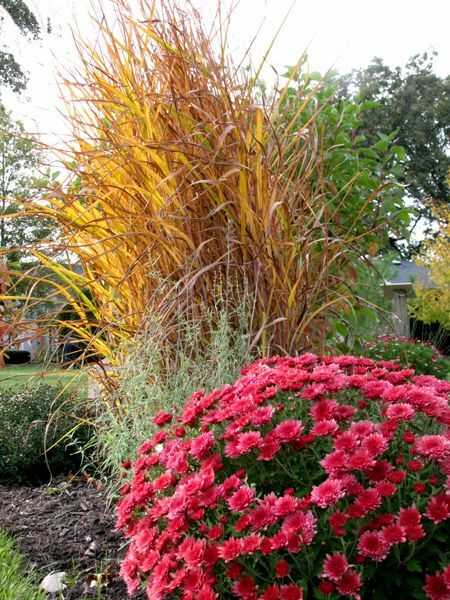 They rewarded us with several new flower stalks that make it seem like summer again. The white ones are especially frilly, but the purple ones are my favorites, with their white bees. 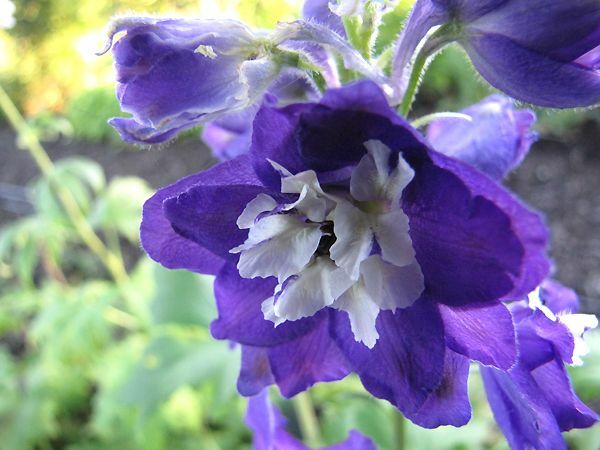 In her new book, The Perennial Care Manual, Nan Ondra says Delphiniums will rebloom if conditions are ideal. I guess they like it here, because these Delphinium x elata 'Magic Fountain Series' semi-dwarf plants have done well for me from Day One, unlike other varieties I'd tried previously. 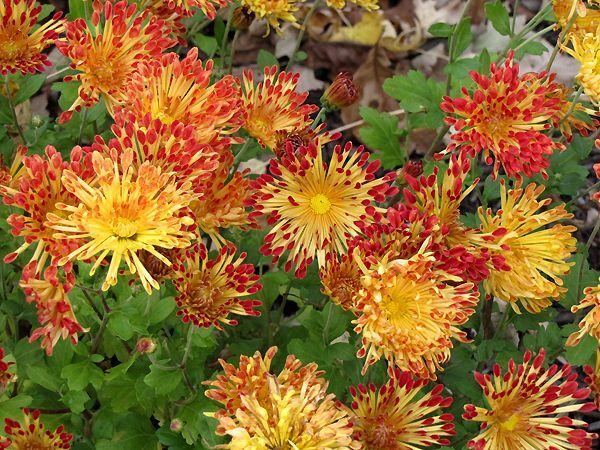 The mums, of course, are still blooming beautifully. I'm kind of on again/off again, as far as mums are concerned, but we've got some in such luscious shades that sometimes I just stand and stare, drinking in the pure hues of salmon, brick red, and deep rose. As I posted Tuesday, the Toad Lilies (Tricyrtis sp.) are in all their glory, while the Asters (Symphyotrichum sp.) are winding down. Endless Summer® Hydrangeas are loaded with blooms, but they're a bit darker in color than they were earlier in the season. Now would be the time to snip their heads off and bring them inside to dry. They'll keep for years like that. The Gaillardias and Geranium 'Rozanne' are all still blooming strongly, as are the annual Zinnias, Calendulas, Cosmos, and Marigolds (Tagetes sp.). 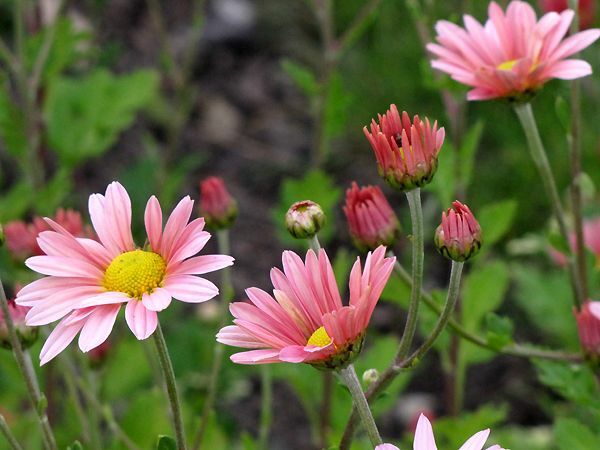 The Marguerite Daisies (Argyranthemum) are still in full pinky goodness, too. 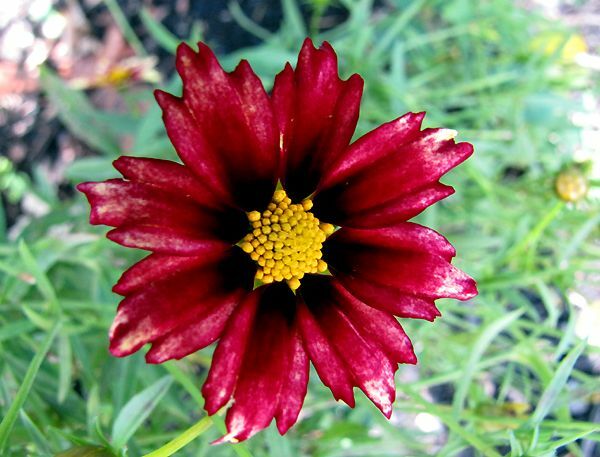 Coreopsis 'Redshift' has become much more red than its 'shifted' color of summer, pale yellow. Likely the cooler fall weather accounts for this. 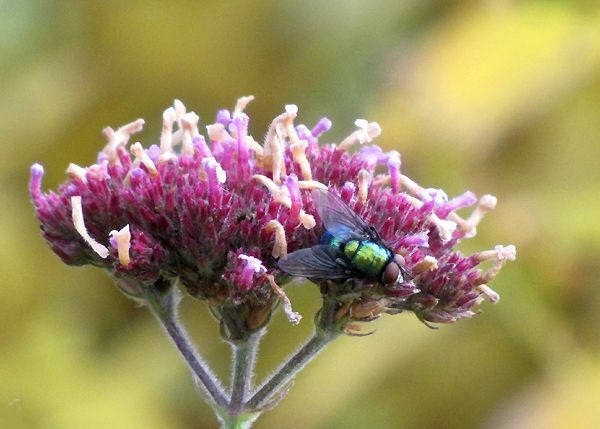 New to the garden this summer was Eupatorium altissimum 'Prairie Jewel.' 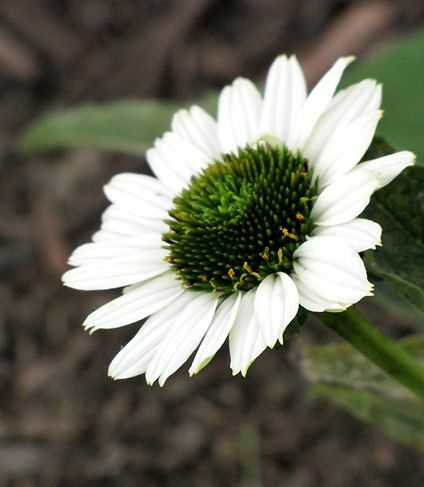 It's got misty, speckled foliage, started blooming its white flowers a few weeks ago, and is still going strong. 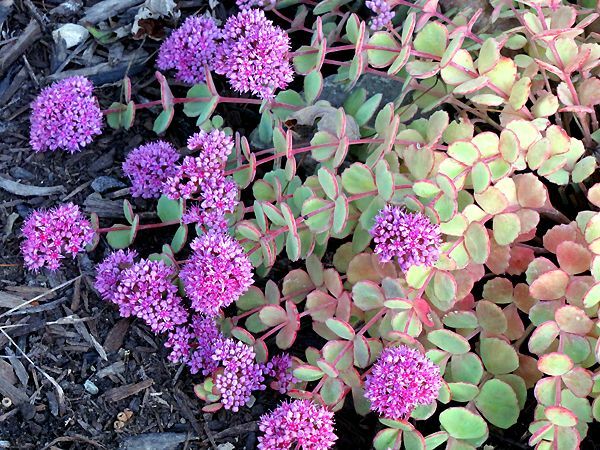 Sedums are still in bloom, but none more beautiful than October Daphne (Hylotelephium sieboldii). Stems sprouting from a single point are a spray of rose-tinged succulent leaves with typical deep pink blooms. 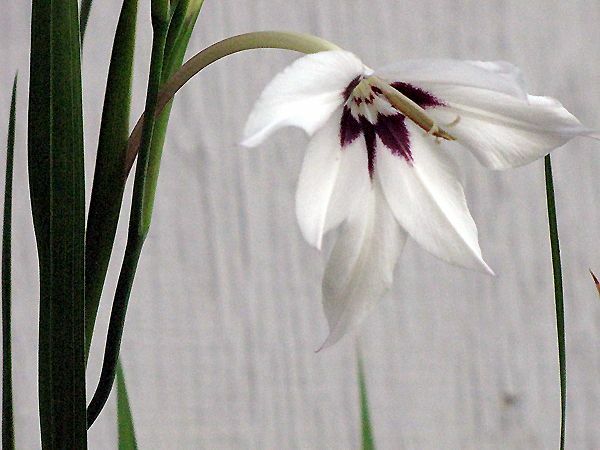 One of my favorite summer bulbs is what used to be called Acidanthera bicolor. 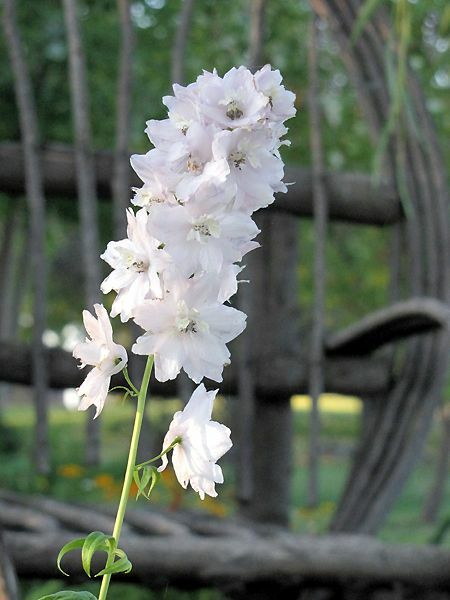 The taxonomists really outdid themselves with this one when they renamed it Gladiolus callianthus. Notice the similarities? Me neither. Let's just call it a Peacock Orchid, which is what its common name is, even though it's not really an orchid. Whatever it is, it sure smells nice. Several of the roses have been putting on some of their most beautiful blooms of the year in the coolness of fall. 'Joseph's Coat' Climbing Rose, which was planted earlier in the spring and seemed to stagnate most of the summer has really taken off this fall. I'm anxious to see how it does next year. If it grows as quickly as one of our other climbers, 'Morning Magic,' we'll have a real show from it. I failed to take a photo today, but its blooms look just like the one shown here from August. Last week, I had to bring plants inside so they wouldn't be damaged by frost and many of those are still blooming, in fact, the Brugmansias are loaded with blooms. 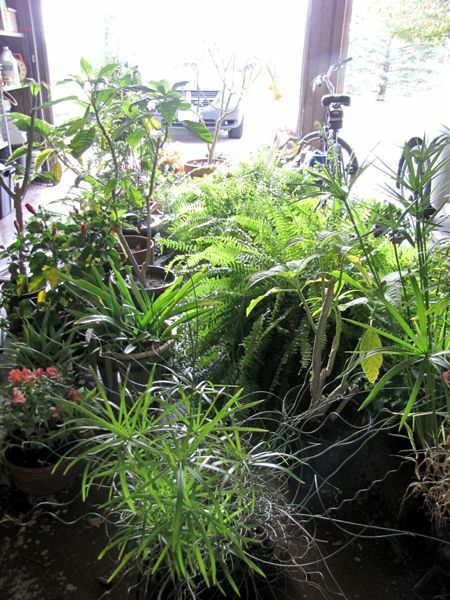 Those are still in our garage, because they need to be sprayed with Neem Oil before I bring them inside. White flies seem to always be a problem, so hopefully I'll keep that to a minimum by spraying before they come in for good. Others blooming are Alstroemeria 'Princess Zavina,' (that's the coral bloom seen in the photo at right), several Pelargoniums, Euphorbia 'Diamond Frost,' and one of the Amaryllis (Hippeastrum) I dug up last week is putting up a flower scape. While we're currently experiencing temperatures that are 15-20 degrees below normal for this time of year, the garden seems to be unfazed by it.